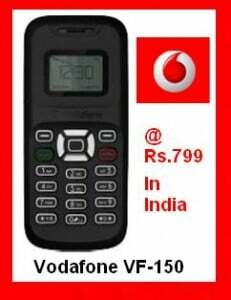 Vodafone Essar, one of India’s leading GSM Mobile service providers, today launched Vodafone 150 (VF 150), the most affordable handset available in the country with a basic price of only Rs. 799. With the launch of this mobile phone, Vodafone aims to increase mobile technology accessibility for millions in India. To maximize the availability of VF 150 among the large and isolated rural populations, Vodafone will provide an extensive logistics infrastructure, reaching deep rural segments where mobile penetration has remained low. Over the next few days, the device will become available across the country. Vodafone has been able to significantly reduce manufacturing costs by focusing on a custom-built feature set and packaging design – without any compromise to user experience, quality or safety. VF 150 comes with one year handset replacement warranty and is priced at Rs.799 (price includes 4% VAT; this price could vary in a few states owing to different tax structures). VF 150 will enable customers to use voice and text based services. Great handset; will definetly do well in Rural expansion of Vodafone. specially Monochrome( B/W) handset have great acceptability in Rural India since long.